Hi there! My name is Kayley, but I'm known as Tsepish online! I'm a freelance artist from Lexington KY, and I run TeaberryHouse! I'm mostly known in the Blizzard fan circles for my cute pins and merchandise, as well as Blizzcon Badges every year! You'll see a lot of fan work in this Patreon, as well as original art. My goal one day is to make being a freelance artist my full time job, grow my online store, and sell at conventions around the country. By supporting me on Patreon, you allow me to spend even more time creating art, with you guys getting some sweet sweet perks in exchange! The bulk of my Patreon is centered around physical rewards, such as enamel pins, stickers and prints! All Patrons gain access to a private Patron only section of my store where you can purchase limited edition items that don't make it to the public. Patrons also get access to my Discord server, sketches and works in progress, occasional timelapse videos and gifs, tutorials and other content before anyone else! You'll receive early access to any new merchandise, discount coupons, and dibs on commission slots. 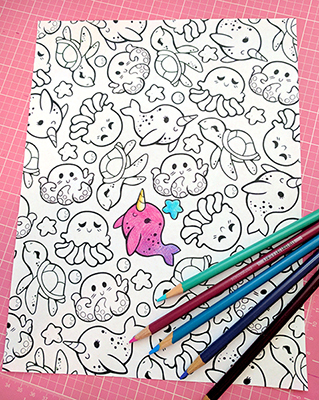 Coloring Book page from June 2017. Even $1 is extremely appreciated and helps greatly! This Patreon is not really intended to be a paywall, so most things will be posted publicly or be for sale (although limited) eventually. This is really to just a support platform if you really love my work and get some cool perks in exchange! Help support by other means! Check out the links below to find some other ways to help out, or simply tell your friends! Please note: Pledges are charged up front and at the beginning of each month thereafter. For example, if you pledge on the 20th of June, you will be charged instantly for the month of June. You will be charged again on the first of July for the following month. All rewards and discount codes will be sent after pledges have been processed. Get access to the Patreon Activity Feed where I'll post sketches and works in progress! Occasional Wallpaper and Lineart files for download. 10% discount code towards commissions, preorders or Etsy. Access to Monthly File Packs with PSD files, Brushes and occasional Timelapses and videos. Looking for some art to add to your walls? As well as getting all the previous $1-$5 Patreon rewards, I'll send you a special envelope with prints and stickers every month! Generally includes 1-2 small or medium sized prints and 1-2 vinyl stickers every month. Domestic and International shipping is included in price for this tier. Items will be shipped out in a flat rigid envelope. Domestic shipping is included in price for this tier. International patrons, please add an additional $6 ($18 total) for shipping costs. Its the pin club, but for International non-US friends! Collector Pack - Prints and Pins! Want both the prints, stickers, and the pin of the month? Look no further! Every month, you'll receive both mail tiers! Print pack and the Pin club! Possible extra small goodies, like magnets, buttons or charms, or seconds pins. Note: International Patrons, please add an additional $10 to your pledge, $35 total, to cover the extra shipping costs. Pin club will get custom backing cards! I'll also upgrade the postcard for all the other mail tiers so my poor old home printer can get some rest. As well as hitting this goal, ALL Patrons will receive a coupon code for 1 free pin from my shop!